Nick Bamford, BVSc(Hons), PhD, DACVIM of the vet school at the University of Melbourne reviews evidence-based studies of treatment for endocrinopathic laminitis, including cryotherapy. At the top of his list is the importance of productive working relationships between veterinarians and farriers. He mentions one of the articles which suggests that it might be beneficial to modify the role of farriers so they might play a larger role in early recognition of the disease; the paper discusses the two ways that farriers surveyed approach their work for a client, as well as the two ways that the clients surveyed perceive their working relationship with their farriers. He also covers the study from the University of Utrecht in The Netherlands, which used Imprint moldable thermoplastic heart bar shoes on two groups of ponies--one group was obese, one was not--and documented improved movement in the obese group while wearing the shoes. Early studies of pain medication (tramadol) and the soluble epoxide hydrolase inhibitor researched by Alonso Guedes at the University of Minnesota are covered as well. Two articles in the collection cover methods of applying digital cryotherapy (immersive icing) as an intervention method. 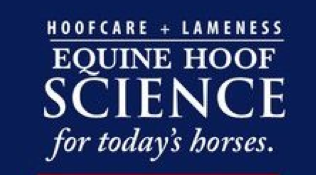 In conclusion, Bamford looks to the future, and the experimental work done at Penn Vet with a novel approach to deliver gene therapy via regional limb perfusion directly to the tissue of the hoof to prevent support limb laminitis in the horse's "good" foot. Nicola Menzies-Gow, MA, VetMB, PhD, DipECEIM, Cert EM (int med), MRCVS is Reader in Equine Medicine at the Royal Veterinary College in England. She focused on the papers in the collection that are concerned with the all-important diagnosis of underlying endocrine conditions in the horse that may lead to laminitis, such as Equine Metabolic Syndrome and Pituitary Pars Intermedia Dysfunction, and the role of insulin dysregulation. 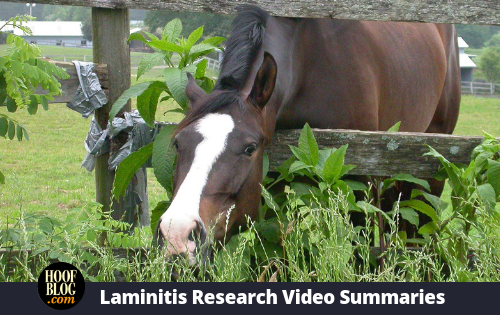 She begins with the shocking finding that 45 percent of cases of laminitis diagnosed by veterinarians were not recognized as laminitis by their owners. Menzies-Gow reviews progress in comparing the tests for insulin resistance, and the recent finetuning of the Oral Sugar Test, which uses common sugar syrup to trigger an insulin response. She also mentions research documenting the dip in the hormone leptin. Finally, she covers the two tests available to measure Adrenocorticotropic hormone (ACTH), and the effects of season on the test results, which can be used to determine PPID or Equine Cushings Disease in horses. Melody De Laat: Does research have a foothold? Melody Dr Laat, BVSc (Hons), PhD, MANZCVS, Grad Cert HE, FHEA is Senior Lecturer at Queensland University of Technology in Australia. Her research covers the mechanism of insulin in laminitis, so she was perfectly suited to summarize that aspect of this special collection of articles. While Nicola had covered the important of determining insulin dysfunction's role in laminitis, Melody is immersed in how exactly insulin can cause laminitis within the horse's foot--where no insulin receptors are present. She pointed to research articles in the collection that determined that while many horses with Equine Metabolic Syndrome are obese, not all obese horses are insulin resistant or at high risk for laminitis. Conversely, thin horses can have hyperinsulinemia and be at risk for laminitis. Much of De Laat's research in the past has focused on the damage to the lamellar tissue in the foot by laminitis. Her studies led to research into the possible that insulin somehow impacts Insulin Growth Factor-1 (IGF-1) receptors, which are found in the foot, and the possibility that hybrid IGF-1 receptors are involved. De Laat sounds optimistic for the future of her research, but listeners might take note of her prediction that perhaps ten years from now researchers will actually understand laminitis, and that when that happens, work on a treatment might begin. Click here to access the index page of the collection on the web to bookmark for reference.